A delicious combination of our favorite products! Pork mixed in our original blend of spices for this amazing snack! 10 - 12 sticks (6 oz.). 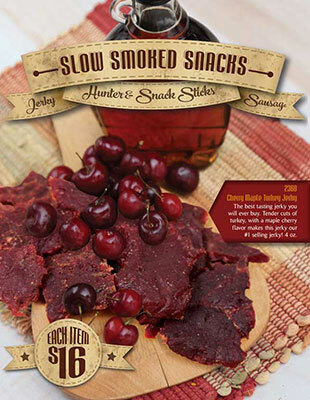 Elk and pork mixed with spices, maple and cherry flavors for an amazing snack! 10 oz. Venison mixed with pork, jalapeños and cheddar cheese for an outrageously delicious snack! 10 oz. Our famous hardwood, hickory smoked sausage is a favorite of every family! Special cuts of beef and pork. 10 oz. Amazing flavors and lean buffalo meat mixed with pork and peppered for a kick! 10 oz. Down on the bayou! The best BBQ cajun gator and pork sausage you'll ever taste! 10 oz. Sweet and tasty! Our smoked teriyaki flavored jerky uses only the best cuts of beef! 4 oz. A taste of honey in each bite with hints of black pepper and smoke. A customer favorite right here! 4 oz. You can't go wrong with an original! The tender smoked beef in our blend of original spices = the perfect snack! 4 oz.